I have a follow-up story for the taxi in the last (long long ago) blog. It doesn't make it any better really. In fact, in a way it makes it worse. 'Haifa?' which is what I thought he was saying was actually 'khaifa?' which means 'scared?' in Arabic. I was, but kept telling him in Arabic, "No, I am Australian". He was obviously frightening me on purpose, and kept laughing his head off. It was an odd sort of misunderstanding, but I am sure that the outcome would have been no better if I had understood him. I now choose very old taxi drivers. Now - let's leave him behind as I have infinitely better things to talk about. Sometime in 1993 I was at art school. I had gone back to University as a mature age student and one of the very first sessions introduced us to the idea of keeping and maintaining a visual diary. I found I really enjoyed this. One of my early entries was a drawing in coloured pencils which I actually spent a lot of time over as I was enchanted by the photograph I was working from. It was a lift straight out of a book, and I had no idea where it came from, but it was a curving whitewashed alleyway dark and secretive under a curved roof with what I assumed were high gutters on either side. Fast forward to our first visit to Libya early this year. I found a photographer in the Old Medina, and went through folio after folio of wonderful large photographs. He was a nice man, educated and well spoken. His English sounded close to perfect, though he insisted that his Italian was better. I bought a collection of portraits of Tuareg people, but lusted after another group of photographs. They were of strange enclosed rooms with organically curved and tilted walls and decorated with cross hatched designs in scarlet and bright colours. When I asked where they were taken he told me it was Ghadames. I had rushed straight to the guide book to look it up when I returned to the hotel as we had three more days and I thought perhaps I could get there. Not a hope. It was way out in the Western desert, nuzzling the border of Algeria. I mentioned it to Bob - well, several times if I am honest, and we planned a trip there at some stage. With Sam we went to Ghadames. We called at several other places on the way, and they will have to wait for a future entry (which means I haven't yet sorted them into sets in Flickr). This is a town which is four thousand years old. It is no longer lived in, but hte poeple still own their own homes in the old town and some apparently stay there occasionally in the heat of Summer when the desert shimmers with temperatures up to 50 degrees Celcius. From outside the old town you see nothing but the wall and date palms, and though the drive had been wonderful I pushed down a flicker of disappointment as we drove into town in the stillness of evening. It was a small and ordinary town, flat and apparently unrewarding. We called next morning at the Museum, an old fort now converted to hold the story of the town. 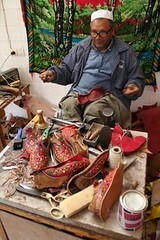 One of the few truly unique things Ghadames could offer to a caravan trader was its embroidered slippers. There is only one man left making these, and his wife embroiders the uppers. The old town is made of mud brick, sun dried, not baked, and sealed with gypsum - brown for the mortar and structure and white used as a whitewash to plaster and seal walls and surfaces. You step into cool caverns which twist and turn away from you, with secret alleys sending shafts of light across your path. Down the sides of the alleys are long benches which curve to the shapes of many of the walls, somehow still holding ghosts of the old men who would sit here to talk. It is a view of crazy log cabin blocks in high contrast, as you will see from the photographs. Ten minutes into the town we turned a corner and there was my drawing. I had the colours wrong. I had tried to colour it in subtle rainbows, like an Impressionist painting. It was simpler, warmer and cooler both at once, but undoubtably the same view. What I had seen as gutters were benches along the wall, dipped and smoothed by many rears over thousands of years. The colours drifted from a mud-tinted umber, pale and cool but deeply shadowed in the corners. the whitewash shadowed blue and grey, but lit to pure white where light shafted from a high narrow rectangle cut in the ceiling. Remember that if you click on the photograph it will open to show you a whole set of photographs that illustrate this paragraph - and so on through the blog. this saves blog space and is simpler for me, flying on my very own new blog-fairy wings. Beyond the town are the gardens, and beyond the gardens a high encircling wall. 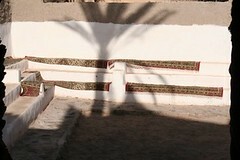 The gardens are full of date palms, and below these were vegetable gardens and pens for goats and sheep and chickens. Horses were never kept in the enclosed area, and only donkeys were used to carry goods, never carts. Many gardens are still in use, and dates are still harvested. Sadly the amazing watering system which kept the town alive is now dry and no longer used, so the gardens no longer grow vegetables. A unique clock kept track of each allocation of irrigation, and each neighbour was told when he could divert the flow of water from his neighbours's garden to his own. As each timing was called a handful of chaff was sprinkled on the water at the source, the landowner would go to his farm, and could not take the water until the chaff appeared. From the rooves of the town you look over the women's world. They were able to move from house to house at roof level, by a system of paths, like acrobats, never touching the ground and invisible to those below. We walked the town with our guide Mahmoud - who remembers growing up there before the population was enticed away with the lure of running water in their kitchens and toilets that flushed - or if they didn't actually flush, were inside the house and not in a central area. He took us to a traditional house for lunch. Because all the houses are still owned and private property most were not open. This one is allowed to be opened and is sometimes used to serve lunch to lucky families like us. There are three levels to a Ghadarmes house. A low entrance level, storage and a formal reception space, then a much higher and wider space upstairs for the families living space and the main lounging areas, then a roof which was the location for kitchens, summer sleeping, and the women's domain. The walls inside were superb. Every space was decorated, sometimes with smaller and dainty patterns, sometimes with patterns which jostled and pushed against each other. There is not a lot of light in these homes. Without glass for windows, and with cold desert nights in Winter and roasting days in Summer, openings were kept minimal. The wall decorations were set with many mirrors. They were disconcerting as they tended to reflect the patterns of the wall opposite, creating odd glitches in the patterning like skyscrapers seen in curved car windows. As I took photographs I kept seeing myself. There were also hundreds of brass or bronze bowls mounted on the wall, curved side out. I found this puzzling, though it was much more attractive as a storage system than the odd wooden trees we sometimes keep mugs on. These were not used as eating bowls though, they were just decoration to reflect more light. We sat on the floor surrounded by rugs and cushions and skins of endangered animals, and ate wonderful soup and couscous (the African influence is strong so far to the west in Libya) and then drank tea poured over peanuts. We were replete and weary - a bad combination. 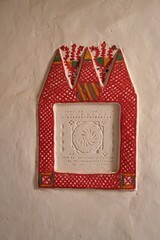 In the afternoon nothing happens in Ghadames. The streets were quieter than Canberra on Christmas Day. Everything closed for the siesta hour - or three. In the evening we drove out to see a Tuareg camp and to watch the sun set over the sand dunes - but that is another blog. also, what i've been able to see through your eyes of life in Africa and the Middle East, I appreciate! Thank you. Yeah, a taxi driver deliberately trying to scare you? Not good. The interiors of those homes is just incredible. I'm always so amazed by the scenes you discover. Glad you're back. Jenny, I continue to enjoy and marvel at your wonderful descriptions of the places you visit. You make the scenes come alive! I'm so glad Boak and I didn't encounter any taxi drivers like your latest one, though! How terrifying for you. So good to hear from you again. Living in such a young country as Australia it is very hard to get your head around the fact that there are places on this earth that are over 4000 years old. I loved you images of this old city especially the first one, the colours are just mind blowing. It is extremely hot in Canberra today. The forecaste was 38o but I think it could go higher and more of the same is forecaste for tomorrow. Those round things (in the set with the slippers) are interesting ... not sure if they are bowls or bags or hats or what - but i really like them! Hmmm ... 8 or 9 of those arches/etc and 3 or 4 of the exteriors would make a very interesting set of quilt blocks! The last set of photos - the interiors - a few quilt ideas there too! - all that red ... it kind of looks like a cross between redwork and who knows what else - and i like it! ... gee I wish I had the time and money to travel to all those places! your photography is amazing, and your experiences so interesting - but i was disappointed that there were no quilts! Haven't had time to catch up with reading your blog for a while, just spent the last hour and a half totally engrossed in your stories and sets of photos, as always, totally spellbinding!! 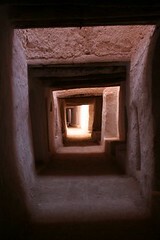 The doorways are intrigueing, so glad you make the time to keep the blog going,it is one of my favourite places!! Yes, the world of women in arabic countries is fascinating. It is not simple to figure out at all, isnt' it? I was there at 14, when my father was building a chemical plant as a contractor. The contradictions left me scratching my head to this day. All that you could see of women was one eye. Except on Tuesdays, which was army day and all the young women were riding on top of trucks with tight uniforms on and only a scanty scarf. They felt very underdressed even to my eye after a month or so there. Or in shops: the scarfs just came off. Unless the woman was talking to a male acquaintaince, in which case, the fabric migrated over her head and face as if by itself. On getting out of the shop, young girls would throw a romantic glance at boys hanging on each side of the doorway and then veil themselves leaving only one eye out. In that harsh sun, covering your face and any other tender bits of skin didn't seem to be too bad an idea, actually. The pictures of the houses are fantastic. Pity I never went to Ghadames. Have you been to the Gebel, Jenny? What do you think? Having just returned to Australia from a visit to Libya - including Ghadames - finding your page has been a delight. Your descriptions are so evocative of this magic place.